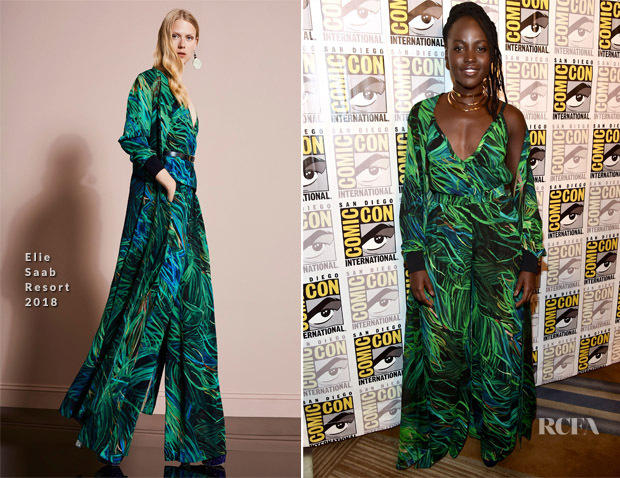 Also making a return to the scene, Lupita Nyong’o was at the Marvel Studios ‘Black Panther’ Presentation during San Diego Comic-Con 2017 on Saturday (July 22). Her affinity for bold hues has not waned, that is, if this Elie Saab Resort 2018 ensemble is any indication. This matching top, trousers and duster is how Elie Saab does dressed-down, with a crave-worthy mix of wavy, vibrant green shades sufficing for sparkling sequins and extensive embellishment. But there was something refreshing about this laid-back sense of glamour and flowing movement of the pieces. The gold Alexis Bittar choker necklaces were unnecessary, although I was fully expecting to see a brighter, colourful lip here.